FAFSA Hints and FAFSA Help for your 2019 FAFSA questions. Read our frequently asked FAFSA questions and answers, or see hints from other readers who survived the FAFSA in our FAFSA Tips and Hints from Students and Parents. Do I need my parents financial information to file my FAFSA? My parents are divorced. Do I need both their financial information for the FAFSA? Should I complete CSS Profile or FAFSA first? I don’t have my tax information yet to file, should I wait to file my FAFSA? How can I update my FAFSA with my final tax return information? 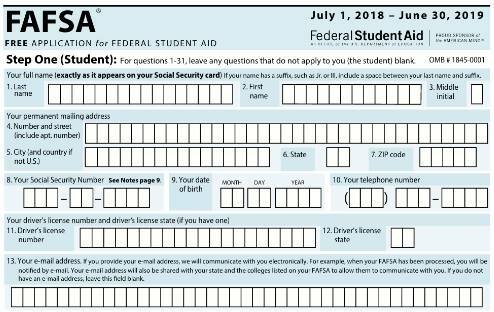 How will I know if any information is missing on my FAFSA? What does that “*” asterisk mean next to my EFC? FAFSA is Free Application for Federal Student Aid, the college financial aid application form that is used to apply for US federal grants, such as Pell Grants, and loans, such as Stafford loans. The application is also used for most state financial aid for college, and many scholarships. CSS Profile is an additional college financial aid application used by many private colleges and universities to award scholarships and grants. If your school requires the CSS Profile, you must complete both the CSS Profile and FAFSA. Most families with income of $40,000 per year or less and an EFC of 5500 or less will qualify for Pell Grant, but it depends on many factors. Your eligibility for a Pell Grant is determined based on the answers to the questions in your FAFSA. If you are a dependent student (most unmarried students under age 24), then you will need your parents financial information to file your FAFSA. If they refuse, your federal financial aid may be limited to only federal student loans . For a complete list of the requirements for dependent or independent students, see Federal Student Financial Aid . If your parents are divorced and you are a dependent student, then you will need the financial information from the parent you lived with most during the last 12 months, and their new spouse (your step-parent) if they remarried. If you don't currently live with either parent, then the parent who you did live with the most during the last 12 months before you were out on your own. If you lived with both equally, then the one who contributed more to you financially during those 12 months. This may not be the same parent who claimed you as a dependent on their tax return. The rules for the CSS Profile are different, and unlike the FAFSA may require both parents financial information if they are divorced. Should I complete the CSS Profile or FAFSA first? If you need to submit both, it may be more efficient to submit the CSS Profile first. All FAFSA information is a subset of the CSS Profile, and the CSS Profile gives you an option to transfer the information to your FAFSA. Starting with the 2017 - 2018 FAFSA, the FAFSA application will be available 3 months earlier starting October 1 of the prior year, the same time as CSS Profile. It is best to estimate your tax information and submit your FAFSA as early as possible and before any college or state FAFSA deadlines. Starting with the 2017 - 2018 FAFSA, you will use your filed return from the prior year (2015), so the process is simpler. The best way is to submit your FAFSA application online and use the IRS Data Retrieval tool. This transfers your information automatically from the IRS and reduces the amount of documentation requested by the financial aid offices. Starting with the 2017 - 2018 FAFSA, you will use your filed return from the prior year (2015). You may submit a FAFSA Correction if you've made a mistake. For more information see how to make FAFSA Corrections. You will receive a Student Aid Report (SAR) in 1-4 weeks after submitting your FAFSA. The SAR summarized the data you submitted in your FAFSA, and alerts you if any data is missing. Submit the corrections or required information ASAP to avoid any delays. An asterisk next to your Expected Family Contribution or EFC means that your application has been selected for verification. You will need to submit additional documentation as proof of the information on your FAFSA. These verification checks used to be random, but are now more targeted based upon where they are more likely to find errors or fraud. Do you have some hints to share with other students about competing your FAFSA? Share your FAFSA hints to help others get the best financial aid offers. Click below to see submissions from other visitors about FAFSA Hints. Check out these other pages for more FAFSA help with your FAFSA Free Application for Federal Student Aid.